An interesting report published in the past couple of weeks notes that the House of Commons Select Committee for Education has seriously criticised the way the English Baccalaureate was introduced to the UK education system by Secretary of State Michael Gove. This is really no surprise with comments including: that there was little if any consultation with schools prior to it's introduction and the fear that students may be 'shoe horned' into taking inappropriate subjects just to ensure that the school can report results within the EBacc criteria. 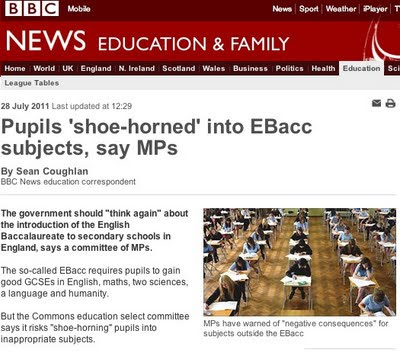 The EBacc requires students to undertake examinations in English, Maths, two Sciences, a Modern Foreign Language and a Humanity (History or Geography). Those passing all these at grade C or above will have their grades recorded with others and contribute to part of the nationally published league table of results for their school. There were many reports last year of schools changing students options after they had selected them and this year massively reducing the range of subjects that students could select from to ensure that they take EBacc subjects. At most risk seem to be vocational and arts subjects.. and this is the cause of concern for very many schools. There are many students who are far better suited to a broader range of subjects. This is not to say that the very wide range of subjects did really need to be reviewed but there is a Government Review of the Curriculum already underway - it's a pity that the Government did not wait for that to report first. Few, including me, will disagree with the need for a decent all round curriculum with students achieving high standards, especially in literacy and numeracy. But the range of EBacc subjects is very narrow indeed and I believe not appropriate for the widest range of students. This is exactly the reason that the Modern Baccalaureate has been established by Andrew Chubb, Principal of Archbishop Sentamu Academy, as an alternative to the EBacc. The ModBacc has been exciting interest in a range of schools and academies.... to read my recent post on this click here. To read the BBC story click here.